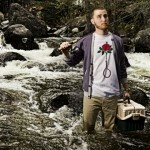 The Californian-based clothing company LRG, has impressed us with its 2010 spring collection. The clothing line is classical, clean cut and practical for the athlete, yet it never comes off as dull, because it incorporates modern touches (like the graphic rose shirt, and the use of vibrant touches like teal and purple). Lately, LRG hasnâ€™t been as talked about, but our intuition tells us that this will all change with this collection, especially with its brilliant use of creativity in their campaigns, which feature famous skate stars (Rob Gonzalez and Kelly Hart) in a wild scenery of waterfalls, lakes and even forests.